AdviceAid Compose is the tool your advisors have always wanted. Imagine over 150 pre-populated advice sheets, containing localised information. Empathetically written by legal experts, with content designed to empower your customers. Advice that is easy to explore, grouped by the most common presenting topics. A powerful keyword search enables advisors to put their hands on the right advice in seconds. Sharing advice sheets with your customers is easy. Print, export to a document, email directly from the app, or copy into your case management system. Beautifully presented, and branded to your Council – housing advice has never looked so good! Localising advice really empowers your customers to resolve their circumstances. Through a simple setup process, add key information on local services, such as: Citizen’s Advice or the Rough Sleeping Helpline. You can even add contextual information such as local rent ranges. Once completed, advice across AdviceAid modules automatically updates (including your website, with SelfServ). It is easy to review localised advice and keep up-to-date. Advice is organised in by the most common presenting topics, these include: Private renting; tenancy deposits; eviction; repossession; homelessness; benefits; social housing; and repairs. Navigating these topics is easy, with a hover over pop-up helping exploration. A powerful keyword search enables the user to quickly locate advice, and further filter by topic. Once identified, simply drop the advice onto the advice sheet – which is now ready to share with the customer. 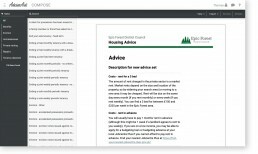 With AdviceAid, users can provide advice sheets that are as beautiful as they are comprehensive. Based on the Government Design System (GDS), providing high levels of accessibility and seamless integration with local government styling. Additionally, advice sheets are branded with the local authority’s logo and colour scheme. AdviceAid is regularly updated to reflect changes in legislation and best practice. AdviceAid Compose enables advisors to be connected to consistent, quality and localised advice, which is being offered across advice channels. These can include the council’s website (through AdviceAid SelfServ), customer service teams and permitted partners. Optional integration with AdviceAid SelfServ enables customers to access supporting advice on your website directly from the shared advice sheet.